Oh baby, what a great idea! | News by Wales Express News, People Before Profit! Home Business Oh baby, what a great idea! Oh baby, what a great idea! A go-ahead mum has set up a new business selling bespoke baby and toddler products and now has customers as far afield as France and New Zealand. 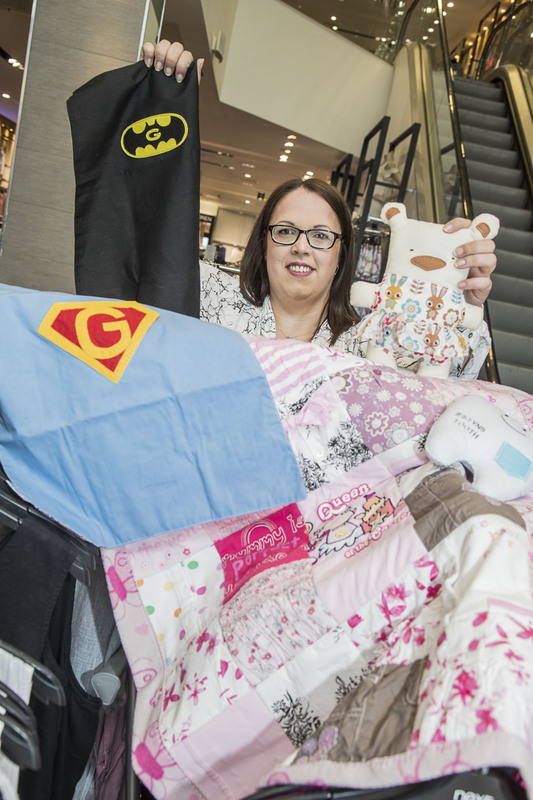 Ceri Roberts, 36, who works as an administrator at the Next store in Eagles Meadow Shopping Centre in Wrexham had difficulty finding items with the name of her newborn son, Gethyn. Ceri Lewiis has started a very successful craft business out of work called Made by Me Little G. She has just sold her first items abroad to New Zealand and France. Armed with a degree in fashion and textiles from the University of Brisol, Ceri decided she could plug the gap in the market for made-to-order commercial baby products. She is now supplying customers across the UK with bespoke baby and toddler products such as memory blankets and fairy tooth pillows and has even sent packages of orders to customers in France and New Zealand. Ceri said: “I have always lived in Wrexham. I was born here but went to Bristol to do my degree. When I came home after graduating I got a job and never really did much with my degree. “My partner, Russell, and I had our son who we named Gethyn, who is now four, but I simply couldn’t find garments or products with that name and spelling. I thought hang on, I’ve got a degree in textiles why don’t I make my own? “So I used Gethyn’s baby clothes and textile-based play items to make a memory blanket with his name, date of birth and birth weight, which was 7lb 7oz, on it. “My brother saw what I’d done and asked me to make a memory blanket for his three sons, using their old baby clothes. Friends then started asking me to make them memory blankets and other items and it’s just took off from there. Ceri now splits her time between working at Next and sewing and working from home while she expands her fledgling business. She said: “I now make quite a range of products from memory blankets to tooth fairy pillows that have a pocket for a child to put their tooth in so the tooth fairy can find it and leave some money. “I also make key rings with a fabric apple attached. The apple has messages on such as ‘Thank You’ or ‘Dioch’, these can be given by children to teachers at the end of the school term, that sort of thing. They are really popular and I have had up to 10 orders a day for those. She added: “I also make personalised advent calendars with 24 pockets for little gifts, soft toys, superhero capes and lots of other things. I can usually make pretty much anything people ask for. “I used to work with a woman who now lives in France and she sent me an order for a personalised advent calendar. That was my first international sale but then I received an order for a lady in New Zealand. But despite her growing business, Ceri has no plans to leave her office administrator job at Next in Eagles Meadow. The former Ysgol Morgan Llwyd pupil said: “It suits me perfectly and I love the job. I’ve been with Next for 10 years this October. Working 14 hours a week means I have plenty of time to be at home with Gethyn and gives me lots of time to sew and make my products. “I love working at Next, the team are fantastic and the atmosphere is great. It’s just a great place to work. “But I do want to see how far my little business can take me and I’d like to expand further. I need to find a craft shop, preferably a Welsh shop, that I can display my work and sell from. Eagles Meadow Shopping manager Kevin Critchley wished Ceri well with her business. He said: “It’s amazing the often hidden talents people working in retail outlets here at Eagles Meadow have. Ceri’s textile products are amazing and I can see why she is picking up orders internationally as well locally.